3D printed word cloud visualises most frequently used words extracted from more that 13 000 messages received during the two year period (2011 – 2012) when the interactive installation Talk To Me was on display in the galleries in Tallinn, Basel, Riga and Ventspils. The outcome of Talk To Me project is also a book, which introduces to the project idea, performed experiments, and analyses the content of the received messages. 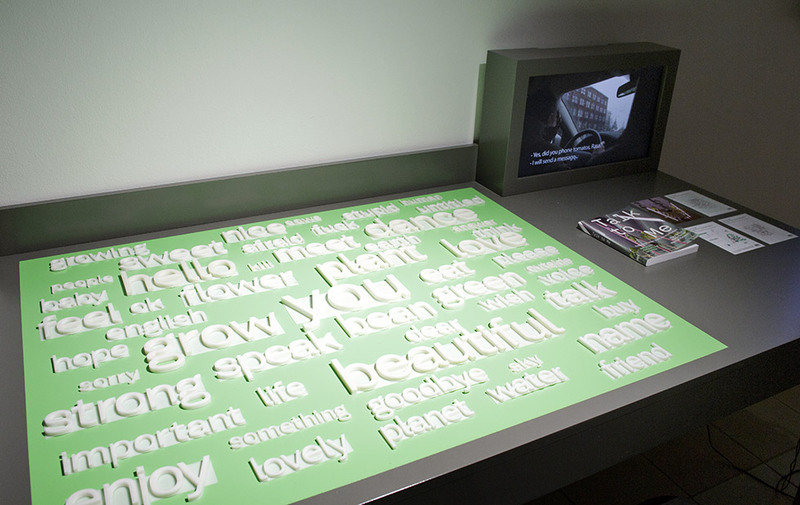 3D printed word cloud is part of the Talk To Me installation accompanied with time lapse video of growing plants, 4 silk prints with word map and word clouds and video documentation about the project. Credits: RIXC – production; Rasa Smite and Raitis Smits – artistic concept, project execution; Martins Ratniks – graphical design; Davis Bojars – programming.